To celebrate the 50th anniversary of the Performing Arts Training Center (PATC) at the Southern Illinois University Edwardsville East St. Louis Center, founded by the legendary Katherine Dunham, the exhibit, “Katherine Dunham: A Life of Dance, Activism and Anthropology” will be mounted in the University’s Lovejoy Library from Sept. 21-Oct. 23. The exhibit opening will be from 4-6 p.m. Thursday, Sept. 21 in the Friend’s Corner of the library and will feature a presentation by Theo Jamison, Dunham master instructor and former program director of the East St. Louis Center for the Performing Arts. Other presentations planned for the month include SIUE Emeritus Professor Eugene B. Redmond from 4-6 p.m. Thursday, Sept. 28 in the Friend’s Corner. “We want people to know about the contributions Katherine Dunham made to dance, SIUE and the world. She was a shining light,” said Cory Willmott, PhD, associate professor in the Department of Anthropology and curator of the exhibit with Konjit Avent, integrative studies graduate student. Thirty panels of photographs and several cases containing artifacts will be on display in the center of the library. The month-long exhibit was inspired by a meeting last March with Willmott, Avent and Leverne Backstrom, director of the Katherine Dunham Dynamic Museum and president of the board for the Katherine Dunham Centers for Arts and Humanities in East St. Louis. Also working to pull the project together was Lydia Jackson, director of Research Commons at Lovejoy Library. “The exhibit would not have been possible if it were not for the hard work and forward vision of Lydia Jackson,” said Willmott. Jackson helped bring the anthropology department, the University Museum and the library together in its first collaboration. “Our motivation was to bring the name of Katherine Dunham forward again and focus on the contributions she made to SIUE,” Willmott said. According to Willmott’s research, Dunham came to Southern Illinois University Carbondale in 1965. She went to Alton in 1966 as a cultural consultant, where she displayed her artifacts that she had collected from around the world. Dunham came to East St. Louis in 1967, where she founded and directed the PATC. At PATC, Dunham taught dance, foreign languages, cultural history and anthropology until her retirement in 1982. SIUE awarded her an honorary doctorate of fine arts in 1983. The Communications Building was renamed Dunham Hall in 1998. “Katherine Dunham invented herself and invented a place for herself. There has been no one like her before or since,” Willmott said. 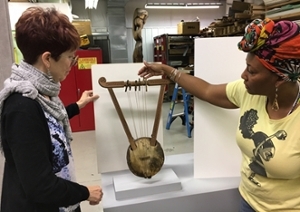 L-R: Erin Vigneau-Dimick, acting director and collections manager of The University Museum, and Konjit Avent, exhibit curator, look at a krar, an Ethiopian instrument similar to one that Katherine Dunham had in her collection.